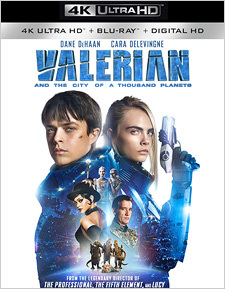 Based on the 1967 French science fiction comic series by writer Pierre Christin and artist Jean-Claude Mézières, Luc Besson’s Valerian and the City of a Thousand Planets depicts the latest mission of Major Valerian (Dane DeHann) and Sergeant Laureline (Cara Delevigne), a pair of spatio-temporal agents for the United Human Federation. After recovering an important stolen artifact from a crime lord in the middle of the galaxy’s largest bazaar, the infamous Big Market, the pair are tasked with protecting said artifact during a crisis back on their space station base, known as Alpha. This station is essentially a vast metropolis, home to millions of different human and extraterrestrial species. But when Valerian and Laureline’s commander, General Filitt (Clive Owen), is captured by aliens unknown to Alpha, they must travel deep into the station’s seedy underworld to rescue him and uncover the creatures’ sinister plans. Though little known by genre fans here in the States, the original Valerian comics were extraordinarily influential, directly inspiring the creation of Métal Hurlant – you know it as Heavy Metal magazine – and many other artists in the medium. There’s a real argument to be made that it influenced George Lucas’ Star Wars too, which arrived in theaters a decade later. The challenge of adapting Valerian into a big screen film experience is not insignificant, given its fantastical stories, lavish locations, and exotic characters, though anyone familiar with Besson’s The Fifth Element will know that the director is certainly up to the task. And indeed, Besson and his team of artists and craftspeople more than deliver the goods here from a visual standpoint. The film’s opening alone sets a high bar for visual design, but its first set piece action sequence – a thrilling chase through the aforementioned market that takes place in multiple dimensions at once – takes that creative effort to a whole other level. In fact, nearly everything about Besson’s production is perfect except the very thing that matters most… the two lead actors. DeHann and Delevigne certainly look the part, but they’re trying so hard to give their characters a droll attitude and glossy-cool manner that their performances feel strangely detached throughout the film. It doesn’t help that every time DeHann speaks, he sounds like Keanu Reeves. These actors just don’t connect emotionally the way the should and so are unable to carry the film’s momentum. Things become even more strange when you watch this disc’s bonus features, and see the two actors actually laughing and goofing off together on set. Had we seen a little more of that charm and energy in the actual film, it would have made all the difference. Still, if this production lacks a certain emotional spark, it is pure 4K eye candy. Valerian was shot digitally using ARRI Alexa XT cameras in ARRIRAW Open Gate (3.4K) and finished as a 2K Digital Intermediate. This source was upsampled and given both Dolby Vision and HDR10 color grades for its release on the Ultra HD format, and is presented here in its proper 2.39:1 theatrical aspect ratio. The lack of native 4K or higher capture shows up as a slight lack of the finest detail in the image (compared to the best of 4K), but there’s still a significant upgrade here in resolution over the 1080p presentation and overall texturing is excellent. The High Dynamic Range shines here though, visible right in the film’s opening scenes. Now, unless you’re comparing them side-by-side, it’s a little difficult to appreciate the difference between Dolby Vision and standard HDR10, except that the former has a bit more punch. Either way, this is a fantastic HDR experience, with deep blacks, intensely bright highlights, and absolutely exquisite coloring. The moment you see the “Pearl” characters (as the species is called, whose skin color is reactive) moving through their environment on the planet Mül, you’ll know exactly what I mean. The Ultra HD format’s 10-bit color space is capable of reproducing something like a billion possible colors and, watching this film, I believe it. Valerian’s palette is stunning, at once bold and nuanced in almost every frame. From an audio standpoint, the 4K disc (and the included Blu-ray) offers an English Dolby Atmos mix of tremendous clarity, with a nicely wide (and tall) soundstage, precise imaging, smooth panning, and strong LFE. The “Big Market” sequence, in particular, dazzles with lively object placement and movement, subtle atmospheric cues, and vertical channel activity. What’s more, Alexandre Desplat’s score has a subtle playfulness that’s well blended in the mix, enhancing the dialogue and sound effects, but never overwhelming them (or being overwhelmed by them, for that matter). Additional audio options include an English 2.0 Dolby Digital mix optimized for late night listening, English Descriptive Audio, and both French and Spanish 5.1 Dolby Digital. Optional subtitles are available in English SDH and Spanish for those who need them. In addition, each disc gives you The Art of a Thousand Planets interactive image gallery, the film’s Teaser Trailer (1:39), and the Final Trailer (1:51). All of these extras are in 1080p HD and it’s mostly interesting material. I would have appreciated a genuine interview with Christin and Mézières, though they do appear briefly in the documentary. Some deleted scenes and/or an audio commentary would have been nice too, but such is not to be. The package does not include the Blu-ray 3D version of the film, sadly, as Lionsgate isn’t producing 3D discs anymore here in the States (it’s available in the UK, though obviously coded for Region B). You do, however, get a Digital Copy code on a paper insert in the packaging. Valerian is far from a perfect film, but it’s wildly imaginative. Luc Besson didn’t just throw his hat over the wall here, he threw it over the Moon… and he damn near caught it too. I’d like to think there’s hope for a sequel, but the film seems to have bombed at the global box office, thus making one unlikely. In any case, if you’re a fan of the original French comics (which are currently being published in English for the first time and which I highly recommend) and/or The Fifth Element (see our 4K review here), Valerian deserves your attention. The film looks spectacular in 4K, whichever HDR format you can view, and it sounds amazing in Dolby Atmos too. The 2K source keeps this from reaching reference quality level, but it’s still a standout Ultra HD release.